I have two geranium rugs and use one in this little patio off my kitchen which is decorated to match my kitchen with Provencal style in mind. 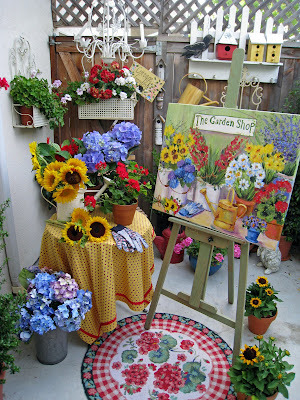 The sunny spot is one of my favorite places to paint as well as grow herbs in pots. The other geranium rug is in my office. I love the cottage garden style of the rugs with the cheery geranium flowers and red check border. I decided to do a post on geraniums since I have received so many phone calls and e-mails asking me where I purchased the geranium rug shown in the Country Sampler Home Tours magazine and asking if I painted geraniums. I purchased the rugs at the Orange Mercantile in Old Town Orange, California and unfortunately the adorable shop closed early this year. My friend Kathy at the Vintage Lady,434 El Camino Real, Tustin, CA 92780 - 714 731-0422 can order the rug for you. She does not have a website, however, she will be happy to order the rug and you can pick it up if you live in the area. For those of you who do not live in the area, I did a Google search and found the rug on the web site at Posh Living -http://poshliving.com/ - telephone - 866 767-4584. Let's take walk around the neighborhood and my garden looking for some geranium inspiration for a geranium painting. My client wants a garden painting with red geraniums and lots of bright primary colors. Let's go back into my garden with my studio assistant, Bentley, and see what we can find for inspiration.
" This certainly smells like a geranium"
"I think we should keep looking for the perfect color"
"I found the perfect geranium for the painting "! Now that Bentley found the perfect geranium it is time to start designing the painting by putting colors together . My client wants red, yellow, purple and white flowers in the painting. A garden hat, seed packets and flowers make up the composition of the painting. Our next step is to paint. The last step is to compare the finished painting to the set up for color and from. Thank you for visiting my blog. It really means a lot to me that you have taken the time to leave me a comment and follow my blog. If you have any questions or would like to see my paint something special, please leave me a comment or send me an e-mail. Have a lovely week. I love geraniums but tend to buy the coral ones. These are gorgeous and you've created yet another superb painting. Ow, I love this post as Geraniums are my favorite annual each year. I plant them like crazy going up my back porch steps...and on the porch itself. I get full sun in the back of my house and they hold up so beautifully. I will start putting them out late April here in NY and they stay in sometimes through November. They are just my favorite annual!!! Your painting is a favorite too, but I love all your paintings so, I couldn't possible pick a favorite. Oh - thank you so much for the information on ordering the darling geranium rug. Your art is beautiful. OH~~~ Everything looks so pretty! I love the geranium rug, and all the geranium flower oh you just inspire me so much. I truly need to work outside, its hard working full time and then make time for all the fun stuff. Have a blessed weekend and thank-you again for having such a beautiful blog I just love visiting you. I just love watching how you work. And with Bentley helping how can it not turn out perfect! What beautiful flowers to use as an inspiration. I love geraniums...they are one of my favorites...they may not smell good..but they sure make up for it with their gorgeous colors! Thank you so much for the information on the rug, I am happy to hear that you paint geraniums as I want to purchase one of your paintings. Have a happy painting day! Thank you for the rug information- I wanted one the minute I saw it in the magazine. Your art is beautiful. I dearly love red geraniums! I see different varieties in your photos! Very interesting! I love the flowers peeking through the white fence! Your art comes alive! You really bring your subjects forward on the canvas (if that makes any sense!) Beautiful as always! Things I love...hats and RED flowers! I was just thrilled to death to see that you came over to my place today. Thanks so much and please come back soon. One of these days, I am going to save enuf of my SOCIAL SECURITY dollars and purchase a small painting of yours. How it would brighten my living room out here in West Texas. Just me again..I just read that you are a breast cancer survivor..if you have read much of my blog, you will know that this is such a mission for me..to spread awareness of breast cancer. I have not had it...but 2 of my dearest friends are both survivors. May I use one of your photos to put on my sidebar, just to announce that you are a survivor and that you donate to the cure? It surely would be an honor for me and if you would rather not, please know that is fine, too! I love this post...so happy and colorful and cheerful. What a lovely neighborhood and so many pretty flowers! I love geraniums. I like how you put a grouping together and then paint such a beautiful painting. Fabulous painting! And Bentley was such a big help. Thank you - thank you for the information on purchasing the geranium rugs - I have two other friends in Texas who must have that rug. Altho the daffs are up, it will b awhile before I can plant my annual geraniums. I over-winter a few indoors but there's not enough room for them all. Thanks for this little taste of summer. I love red geraniums and your painting is just beautiful! I was so thrilled to see you in Country Sampler magazine. I told my husband....I know her!! It was a wonderful article and couldn't have happened to a more deserving person! Bring on Spring! You've really inspired me with all the gorgeous geraniums. You are so talented*! Your pictures are beautiful*!!! I agree with my friend BJ . Your flowers and pretty art are so special . I love flowers , wish I had your talent . That sweet doggie fits right in to to your yard and art . What an inspirational and colorful post. I love geraniums, your dog and your painting! !